Please be informed that our connecting walkway between HON-KAN and HANA-KAN is not available because of a construction work. 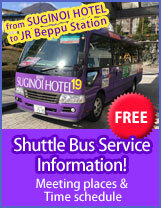 Kindly note you are feel free to use our shuttle bus from of each entrance. We sincerely apologize for any inconvenience this may cause and thank you very much for your kind understanding in advance.